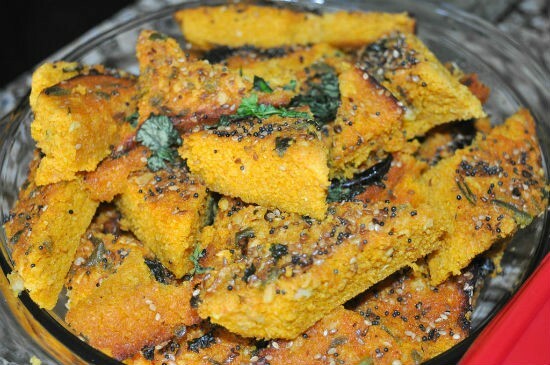 Handvo (or Handwa) is a popular Gujarati savoury dish made with semolina and yogurt. 1. Mix the semolina with 3 tsp oil in a bowl. 2. Add the yogurt, cucumber, carrots, peas, onions, ginger, red chilli powder, turmeric powder, salt and baking powder. 4. Pour the water gradually and mix until it has a thick, pourable consistency. 5. Heat oil for tempering. 6. Fry the tempering ingredients and pour it over the batter. 7. Stir well and transfer the batter to a greased round cake pan or a oven-safe plate. 8. Place the pan into a preheated oven at 200C/400F for 30 minutes or until cooked. 9. Insert a knife or a skewer into the center and if it comes out clean, then it is cooked. 11. If you do not have an oven, pour the batter into a nonstick pan. 12. Place it over low flame and cover with a lid. 13. Cook for 7 to 8 minutes or until the crust is golden brown and crispy. 14. Flip it over and cook for another 3 minutes. 11. Serve with coriander chutney or sauce. 12. Store any remaining handvo in an airtight container. This stays good for up to 3 days. 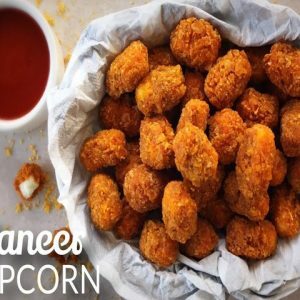 Feel free to comment or share your thoughts on this Handvo Recipe from Awesome Cuisine.